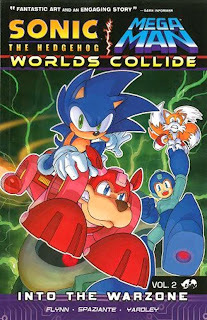 The remainder of Sonic/Mega Man: Worlds Collide, the crossover between Archie Comics’ Sonic the Hedgehog, Sonic Universe, and Mega Man titles, fulfills the strong promise of the first volume, Kindred Spirits. It’s a book that had to work on multiple levels: as its own all-ages narrative, as an anniversary celebration, as a tribute for the fans, and eventually as a continuity reboot for the Sonic books due to a falling out with a former creator. That it succeeds on all of these levels is quite impressive. Much of the success can be attributed to a creative team made primarily of huge fans, especially Ian Flynn, who started plotting out the book three years earlier when Archie grabbed the Mega Man license. The plotting isn’t all that complex. Most of the second volume, Into the Warzone, follows Sonic, Mega Man, Proto Man and Tails as they try to cure their now-evil friends. The third volume, Chaos Clash, is the grand final battle against literally every Robot Master ever created (aside from the original eight, who changed sides long ago, a fact I learned from reading this book). However, since there are so many characters involved and the books are technically aimed at children, I understand why they went a more simplistic route with the storyline. 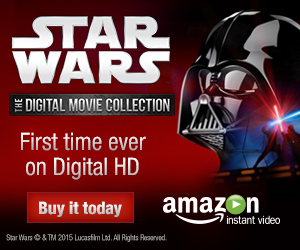 There’s a lot of good character work with both the heroic and villainous leads. Mega Man and Dr. Wily both come off as more “orderly” than the smug-but-likeable Sonic and the off-kilter Dr. Eggman, the latter of whom also shows just how evil he is by nearly killing Dr. Light. As far as character selection goes, the books hew closer to the video games than they do to the various comics and animated series. Thus characters like Rotor the Walrus and Bunny Rabbot are ignored in favor of the newer Silver the Hedgehog and Blaze the Cat. Knuckles is unfortunately underutilized, but this is partly due to that aforementioned falling-out with Ken Penders, who created much of Knuckles’ supporting cast. When the Sonic the Hedgehog continuity was rebooted at the end, the resulting universe seen in later comics was designed to focus more on the games while Knuckles’ new status quo is being ironed out. This reboot was worked rather cleverly into the plot: since Wiley and Eggman’s scheme to merge their universes had to be undone somehow, why not have the inevitable reset go awry? It does mean that Chaos Clash ends on a sad note as Sonic realizes that something has gone terribly wrong. Before that point, however, Worlds Collide spends quite a lot of time paying tribute to older comics and games. In one great wordless sequence, Mega Man is foiled by a Sonic-style obstacle to Sonic’s amusement moments before the hedgehog steps into a Mega Man obstacle. Another wordless sequence comes near the end as the two heroes power up into their super modes. This would normally be a huge, dramatic (and page-consuming) moment, but it’s so expected that it’s even on the cover of the third trade. Instead, Flynn chooses to focus on the unraveling Eggman/Wily relationship while Sonic and Mega Man transform in the background. There are game-based jokes such as Sonic’s infamous inability to swim and Dr. Wily believing that Sonic must be dangerous due to being covered with spikes -- some of the most dangerous obstacles in his home universe. There’s a great system in play to keep the story flowing as Mega Man constantly shifts which power he’s using. Not only does his armor’s coloration switch, but a caption pops up to show what he’s firing, and, often, who he defeated to get it. Artistically, Tracy Yardley and Ben Bates keep to the house style while still providing their own flourishes. Yardley tends to draw more close-ups on faces while Bates has some more adventurous panel designs. Each trade contains back matter with page layouts, cover designs and notes from Flynn, the artists, and cover artist Patrick Spaziante. The Into the Warzone trade corrects an oversight from Kindred Spirits by including the “Off Panel” and “Short Circuits” comic strips which were left out. These ran on the last pages of the original issues as gag strips making light of weird bits of continuity and breaking the fourth wall. Of these, the best is Sonic’s reaction to hearing about the “Genesis Unit” -- a group of Mega Man villains -- and flashing back to the '90s Console Wars. That flashback is more than a bit ironic since you can now play as Sonic and Mega Man in Super Smash Brothers. It’s fitting that the two franchises have come together both on the comic book page and on the video game loading screen. Perhaps someday, Sega and Capcom could be convinced to adapt Worlds Collide into a game of its own. The comics themselves typically adapt individual games as story arcs; various Sonic and Mega Man games are cited throughout Chaos Clash. Whether in the individual trades or in the upcoming complete hardcover, Sonic the Hedgehog/Mega Man: Worlds Collide remains a great buy. I don’t think an inter-continuity crossover has worked out this well since JLA/Avengers.